Governor, 1814-1817; state legislator and attorney general; U.S. Charge d'Affaires to Central America. Lived three miles north. After his term as governor, William Miller (ca. 1783-1825) was appointed to a diplomatic position in Central America but died en route to taking up the post. 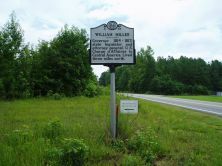 Born in Warren County, he was the second son of Thomas Miller Jr. His mother is thought to have been a daughter of Allen Love of Brunswick County, Virginia. Upon the death of his father in the early 1790s, young Miller inherited a plantation of 930 acres. His early education was apparently at Warrenton Male Academy, under the Reverend Marcus George. He enrolled in the University of North Carolina in 1802, but left school prior to graduation. By 1809 he was a resident of Warrenton and was engaged in the practice of law. Miller married Lydia Anna Evans in 1816, but their union was to prove to be only of brief duration. She died in 1818 at her father’s home near Petersburg, Virginia. Their only child, William, Jr., followed her in death while still a small boy. 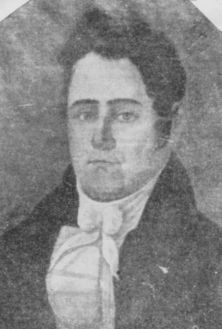 In 1810 Governor David Stone named Miller to succeed Oliver Fitts as state attorney general. That same year Miller began the first of four terms in the General Assembly, twice serving as speaker of the House of Commons. Although returned for a fifth term, he resigned to become governor upon his election to that office. Miller served three terms as governor (1814-1817), and was the first to occupy the newly completed Governor’s Palace at the south end of Raleigh’s Fayetteville Street. Within the context of national politics, he supported the military policies of President James Madison during the concluding weeks of the War of 1812 by ordering out additional militia forces for potential service on the southern frontier. With regard to internal affairs in the state, he lent his support to the early efforts to establish a system of public education, improve trade and transportation, and reform the penal code and judicial system. In 1817 he and Archibald D. Murphey joined forces in an unsuccessful effort to establish an independent supreme court. That effort would come to fruition during the following year under Miller’s successor. It is of interest to note, as well, that it was during Miller’s tenure as governor that the Canova statue of George Washington was commissioned. 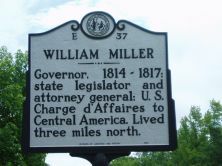 Following several years in Warrenton as a private citizen, Miller returned to Raleigh in 1821 as a member of the state Senate for Warren County. In 1825 President John Quincy Adams appointed him a diplomatic agent to Guatemala. However he died of yellow fever on December 10, 1825, at Key West, en route to assume his new post, and was probably buried at sea.